Using X-ray, radio, and optical data, a team of astronomers has discovered a “radio phoenix” in Abell 1033. 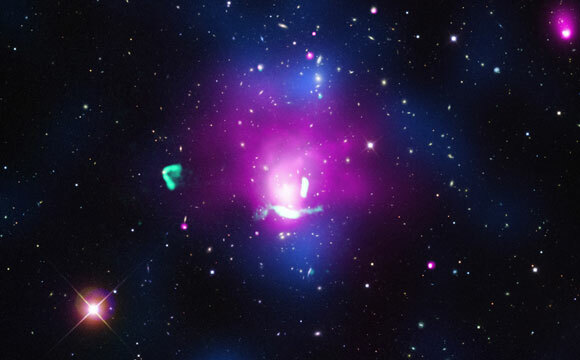 This system contains the collision of two galaxy clusters located about 1.6 billion light years from Earth. Astronomers have found evidence for a faded electron cloud “coming back to life,” much like the mythical phoenix, after two galaxy clusters collided. This “radio phoenix,” so-called because the high-energy electrons radiate primarily at radio frequencies, is found in Abell 1033. By combining data from NASA’s Chandra X-ray Observatory, the Westerbork Synthesis Radio Telescope in the Netherlands, NSF’s Karl Jansky Very Large Array (VLA), and the Sloan Digital Sky Survey (SDSS), astronomers were able to recreate the scientific narrative behind this intriguing cosmic story of the radio phoenix. A new portrait of this radio phoenix is captured in this multiwavelength image of Abell 1033. 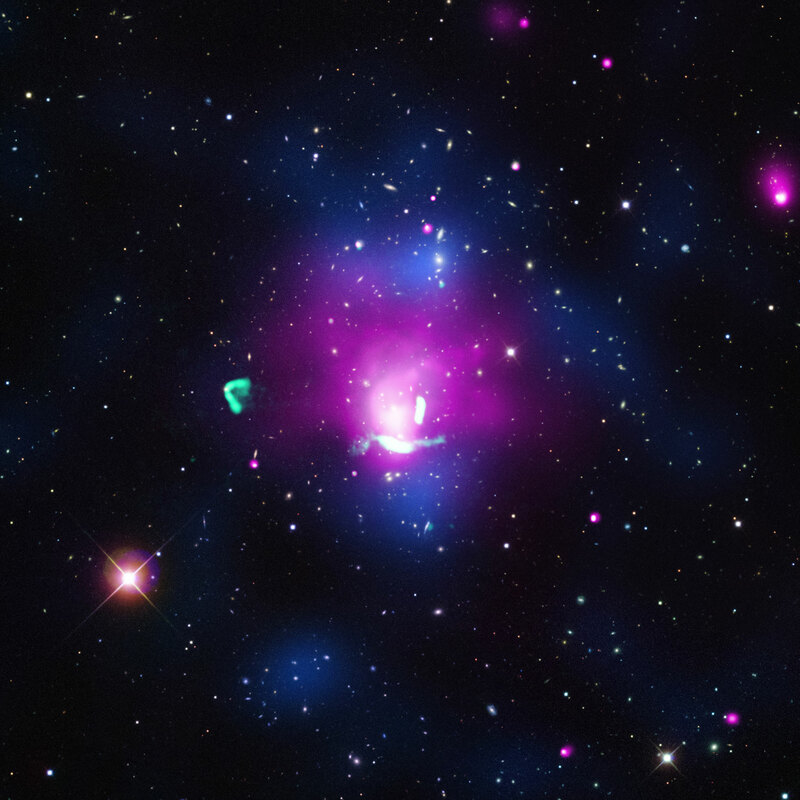 X-rays from Chandra are in pink and radio data from the VLA are colored green. The background image shows optical observations from the SDSS. A map of the density of galaxies, made from the analysis of optical data, is seen in blue. Mouse over the image to see the location of the radio phoenix. Astronomers think they are seeing the radio phoenix soon after it had reborn, since these sources fade very quickly when located close to the center of the cluster, as this one is in Abell 1033. Because of the intense density, pressure, and magnetic fields near the center of Abell 1033; a radio phoenix is only expected to last a few tens of millions of years. A paper describing these results was published in a recent issue of the Monthly Notices of the Royal Astronomical Society. The authors are Francesco de Gasperin from the University of Hamburg, Germany; Georgiana Ogrean and Reinout van Weeren from the Harvard-Smithsonian Center for Astrophysics; William Dawson from the Lawrence Livermore National Lab in Livermore, California; Marcus Brüggen and Annalisa Bonafede from the University of Hamburg, Germany, and Aurora Simionescu from the Japan Aerospace Exploration Agency in Sagamihara, Japan. Be the first to comment on "Chandra Reveals the Birth of a “Radio Phoenix”"